The first official summer blockbuster has come. No I don't mean Fast Five....I'm going to be technical and say that that was a Spring film. I am talking about THOR!....if you remember this was number 7 on my summer preview list. I've always liked Thor but I would be lying if I said I followed his exploits with the dedication that I give to Green Lantern or Bats or X-men or even Spiderman. That said I do like the guy and in the hands of a great writer his comics rank with some of the best Marvel has to offer, but we're talking about the film today. Unlike many detractors when I heard that Kenneth Branagh was taking control of the film I was ecstatic. His love of Shakespeare and costume fits perfectly with the world of Thor in which political structure and family betrayal play huge roles. I never understood how people didn't see the thematic similarities between Thor and Hamlet...which is regarded as one of Branagh's best film. Ok enough of that on to the film. In short....this movie rocks. It is exactly what a superhero movie should be. Again this isn't The Dark Knight, but it is the comic perfectly brought to life, and I couldn't ask for anything more. Branagh strikes the perfect mix of action, drama and humor and takes us all on a fantastic two hour journey to Asgard and back. The story revolves around Thor, son of Odin, who is about to be crowned king when intruders come to Asgard. 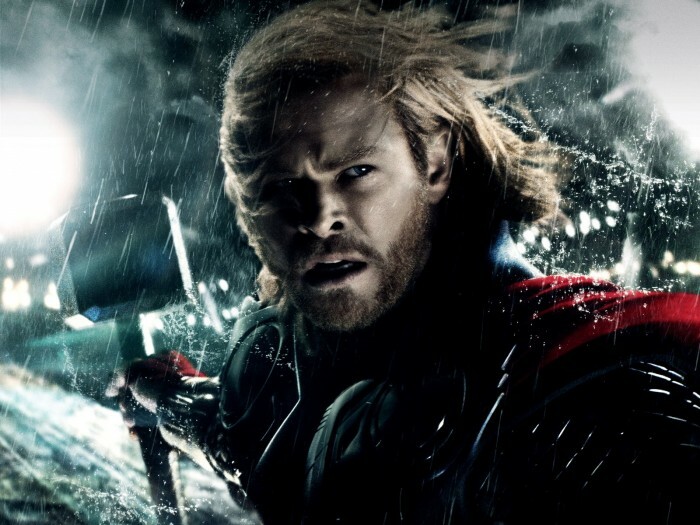 Headstrong Thor disobeys his father's wishes and goes to the intruder's homeland to start a war. Because of this he gets banished to earth and stripped of his powers. The rest of the story is Thor learning humility from Jane Foster, and back in Asgard Loki, Thor's scheming younger brother takes his chance at stealing the throne for himself. I mentioned tone before and I want to stress just how well Branagh creates a film that entertains and stays true to the Marvel universe. I have a piece I'm working about the upcoming Avengers movie, but I will say this...this movie fits in perfectly with that universe. Throughout the film there are little hints at what's to come and not like the flashing light that was the shield in Iron Man 2, these pieces of information are just part of this world. Whether its referencing the Hulk or badmouthing Stark these are no longer big red flags showing you how clever the writers are, these are now the building blocks of a universe. One can fully imagine Thor speaking to Tony as warrior to warrior. I obviously haven't seen Captain America yet but I am more excited about that film now than ever. There really is so much to talk about with this film. Whether its the set design or the costumes, or the action sequences which show the full power mjolnir, or the amount of humor that Branagh weaves in without it ever feeling trite. Rather than dive deep into all these I am going to talk about some of the characters and how well they come off onscreen, but before we do Portman is great as a foil to Thor but has overall relatively little to do. I love Skaarsgard and it looks like his role will end up playing a bigger role in this universe than you would think. Hopkins is perfect as Odin. First off Hemsworth was born to play Thor. Anyone with any slight knowledge of Thor can see this within the first few scenes of the film. He's charming, arrogant, honorable, and caring all at once. Nuff said. Hiddleston will get less attention but he is a PERFECT Loki. Loki was never a maniacal villain bent on destruction like say Green Goblin or Apocalypse. 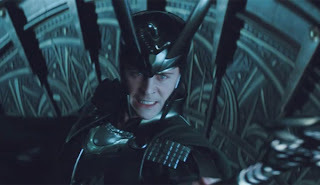 Loki is much more in the realm of Magneto, someone with a different worldview in search of power. Loki has always lived in Thor's shadow, and while Thor is the embodiment of strength Loki is a master of deception and wordplay. Hiddleston does a great job at keeping Loki sympathetic, who ultimately is just trying to impress his father. We see him constantly play both sides in order to further his search for power. I pride myself on being pretty observant when it comes to film and even I was surprised at one of Loki's betrayals close to the end of the film. Hopefully not only will wee see much more of Hemsworth as Thor, but Hiddleston's Loki as well in the upcoming Marvel films. 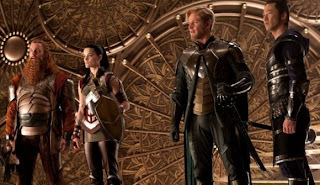 The last characters I want to talk about are Lady Sif and the warriors three. They were all but completely absent from the trailers, but have pretty big supporting roles in the film. I suppose you could say that they bring the comic relief but Branagh again does an amazing job at bringing the warriors three to life. Ray Stevenson and Josh Dallas definitely emerge as scene stealers. Ray Stevenson is Volstagg who has a healthy appetite and a big heart, here he manages to bring that big bumbling strength to the screen with superb energy. Dallas as Fandrall was probably my favorite character aside from the main cast. Dallas does his best Errol Flynn and brings Fandrall's smirk and charm to fruition. Seeing the warriors three in action we see just how unique each of the characters are, from Fandrall's constant grin to Volstagg's unstoppable force, and Hogun's subtle lethal warrior and Sif as the amazing acrobat. This kind of attention to detail is exactly why this movie works. Every character and moment is given the respect it deserves. Whether its the beauty of Asgard, to the Rainbow Bridge, even Rene Russo has a chance to show off her skills with a blade. I mentioned before that this is the comic brought perfectly to life. Branagh does what comics do best and tell an amazing story that is entertaining and that you want to go and tell your friends about. Sometimes that's really all I want from a comic book movie. I would probably say X2 and Spiderman 2 still rank as my favorite Marvel movies, but this is a strong entry. Definitely above either of the Hulks and probably a step up from Iron Man although that could just be from me being excited that they were able to make a Thor movie successful. Very happy with the way Marvel is shaping up lately. Iron Man was great, 2 was underwhelming and the less said about Wolverine the better. Thor really knocks it out of the park, I'm hoping Captain America can do the same. One last thought - Hawkeye's cameo was relatively pointless...I'm excited to see more of Renner the little bit we see of him reinforces that he is perfect for the role. giving the reigns to Kenneth Branagh is both confusing and yet seems like the right move. He's never had anything with this type of budget or this type of pressure on it, yet because of his 90's films (despite them bombing at the box office) he seems perfectly suited to do something interesting with the material.